I first started making food gifts for Christmas when I moved away from home. I was a starving young person trying to eek out a living in the big city and cooking gifts was a lot cheaper than buying them. But there are other advantages as well. Don’t tell anyone, but it’s a lot easier and more relaxed to make your presents. The only shopping you have to do is for ingredients and the grocery stores are not nearly as crowded as the malls and boutiques. If nature decides to dump a big pile of snow on your home the weekend before Christmas, it doesn’t disrupt your plans because you were going to stay in and cook up gifts anyway. The best part of giving homemade food gifts is the appreciation you get in return. If the receiver of your gift is a cook themselves, they know how much work went into it and are genuinely thankful. If they’re not a cook, they are likely to be even more in awe of your skills. You can’t lose. Cookies are of course one of the first things people think of to make as presents. I like to make several different kinds, for festive variety. This can get complicated quickly, the first time I tried it, I found myself in the kitchen for what seemed like weeks, making five different cookie doughs. Through experience (and reading lots of cooking magazines) I learned how to make it a lot easier on myself. Many cookie doughs are quite similar, so you can start with one or two base doughs and transform them into quite a number of very different cookies. Have a look at this article from Fine Cooking magazine. They give three dough recipes that can be made into nine different cookies! If you’re really organized (and have the space) you can bake them in advance and freeze them. I like to turn Christmas gift cooking into an opportunity to learn new things. While this can be dangerous if you have a disaster, it keeps things interesting. Just give yourself enough time to make a backup gift if your experiment doesn’t turn out. This year I tried my hand at candy making. I’d made peanut brittle in the past, but had never tried caramels. My first batch turned out a little harder than I wanted — more like toffee — but with some adjustments to the cooking time, I’m hoping the second batch will be nice and chewy. 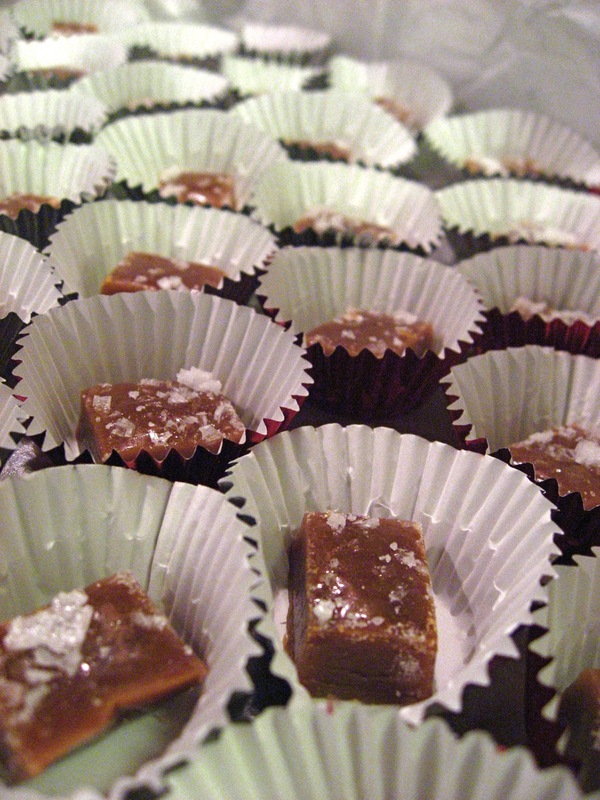 So, some friends and family will get toffee this year and others will get caramels. As Saint Julia says, “never apologize.” So what if it’s not exactly what you planned, if it’s tasty, then who’s to know? I’m already thinking about next year’s gifts. Winter is the height of the citrus season, and here in New York we get lots of beautiful lemons, oranges and grapefruits from Florida, California, and Europe. Maybe I’ll try making a citrus fruit curd next year. If you’ve seen the price on imported jars of English lemon curd, you’ll know why this makes a great gift. The other secret is, it’s dead easy to make. Most recipes are for lemon, but you can substitute any citrus fruit; I’m thinking grapefruit would be fun. The best recipe I’ve seen is again from Fine Cooking, can you tell I’m a fan? Tangy, citrusy gifts are the perfect thing to brighten up these dark days of winter. Nigella has a passionfruit curd recipe. …I’ve never actually *used* curd for anything, so I haven’t made any of them, but they look awfully nice. I’ve had lemon curd on scones with clotted cream. Mmmmm. I would imagine you could use them anyplace you might use jam or butter. Actually, the Fine Cooking recipe suggests serving the lemon curd with Scottish Shortbread.